What are called aqueous ozone cleaning systems are starting to make significant inroads in the professional cleaning industry. One of the initial goals of the manufacturers of these products was to prove to the professional cleaning industry these systems clean effectively, that they can be used for daily cleaning, and that they offer what is now called “on-demand” cleaning, allowing the cleaning worker to use the system whenever needed/wherever needed, without needing to gather supplies from a janitorial closet. Scores of studies have now been released that prove the cleaning effectiveness and value of these systems. Further, as cleaning professionals begin to use these systems, they find the manufacturers were correct and the systems are equally suited to handling both daily and on-demand cleaning tasks. • Packaging materials – boxes, plastic, etc. – to package cleaning solutions. • Containers – gallon, five-gallon, and ready-to-use containers that hold cleaning solutions. • Fuel – to transport cleaning solutions. • Greenhouse gases – fewer greenhouse gases are released because less fuel is used. • Cleaning-related waste is minimized. As the cleaning effectiveness of these systems becomes recognized, along with their green and sustainability attributes, many more cleaning professionals, building owners and managers are becoming aware of aqueous ozone cleaning systems and more are likely to follow. And while these systems are very safe and relatively easy to use, cleaning professionals should be aware that as with any cleaning tool or equipment, these systems must be used properly. • Some aqueous ozone cleaning systems are wall-mounted and connected directly to a water source, under a sink or in a janitorial closet. If using a wall-mounted “fill station,” as they are often called, the aqueous ozone can be poured directly into a bottle sprayer and then used as you would a traditional cleaning solution. • Along with pouring aqueous ozone into a sprayer, cleaning professionals can also fill buckets, autoscrubbers, carpet extractors, and other tools and equipment used for cleaning. • Aqueous ozone should be mixed with cold water; by the way, this also helps promote sustainability by reducing energy consumption. • Do not mix aqueous ozone with any other cleaning solutions. • As to where to use aqueous ozone, it can be used to clean most all surfaces in a commercial facility including countertops, restroom fixtures, floors and walls, carpet, glass, and stainless steel. • While aqueous ozone will work with any cleaning cloth or mop head, microfiber cloths and mop heads are recommended for best results. • If cleaning a smaller floor area fill a bucket with aqueous ozone from a fill station and them mop with a clean mop head. • For cleaning larger floor areas, aqueous ozone can be applied to the floor directly from a “caddy” system. 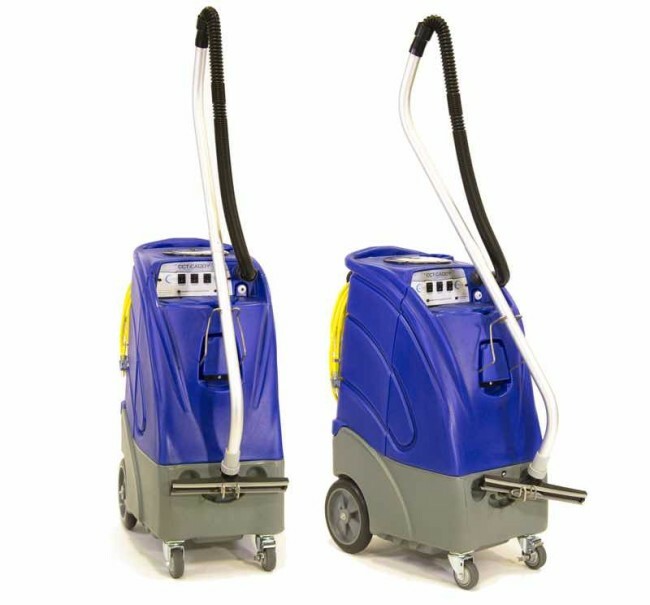 A caddy is a rolling aqueous ozone system, looking similar to an upright carpet extractor that allows for on A site/on-demand cleaning. From there, the floor can be mopped with a clean microfiber mop, or wet vacuumed. • As mentioned earlier, aqueous ozone can be used to clean carpet; this is done by using the caddy system as a carpet extractor; a wand attachment is available for the machine. The carpet can also be pre-sprayed with aqueous ozone as well and then cleaned with a traditional extractor. • While aqueous ozone is considered a powerful general purpose cleaner, it is not recognized as a disinfectant; however, however several studies have concluded that aqueous ozone does have antimicrobial properties. • Although it is not necessary to use protective clothing when working with aqueous ozone, as with all cleaning, gloves and goggles are recommended.